The holiday season is almost here, and Michael Walsh has the destinations to fill your Christmas weekends. The humble Christmas market, there’s nothing quite like the smell of it. The delicate aromas of seasonal spices that just aren’t around the rest of the year. The sweet scent of cinnamon, cloves and nutmeg flood the nostrils marking the imminent arrival of the favourite holiday. Throughout the continent, the festive markets are the destination of many weekend holidaymakers, ready to fill their hearts and bellies to the brim with Christmas cheer. The markets in Copenhagen start the earliest with the Nyhavn Harbour market starting on the 9th of November and lasting until the 23rd December. Nyhavn Harbour is the most famous harbour in Denmark and serves as a beautiful and stunning backdrop to the seasonal festivities. Feel the warm, cosy atmosphere and listen to the carols while browsing through the stalls that line the waterfront. Get lost in the magic of the Danish craft goods, merry food and warm drinks that are sure to ignite the imagination of people of all ages. Germany has become synonymous for its Christmas markets, offering tasty Germanic sweets and treats like Baumkuchen and Stollen. Berlin is Europe’s most popular destination for a seasonal getaway but with over 60 markets in the city throughout the Christmas period, there’s no need for fear of overcrowding. Weihnachtszauber at the Gendarmenmarkt is Berlins biggest market and hosts up to 60,000 people every year. Running from the 24th November to 31st December, the month-long festivity will cost you €1 entry (except for children under 12) and is open daily from 11am-10pm. 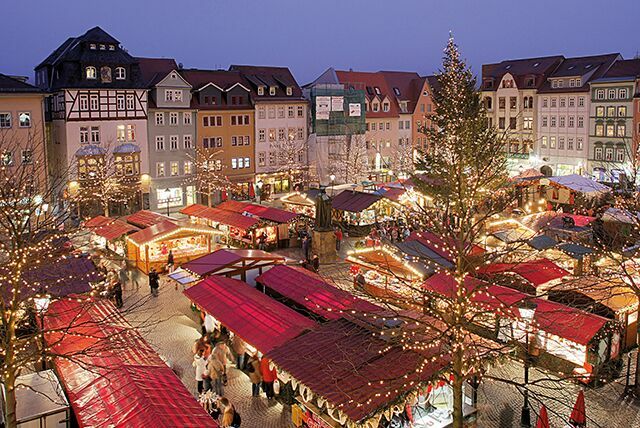 Trades like glassblowing and candle-making can be seen producing their traditional crafts in the frosty German square. Unlike most other Christmas markets, this one has an indoor section that market-goers can warm up in while browsing through the local handicrafts. The Hungarian capital of Budapest offers the seasonal tourist a more convenient shopping experience. Alongside all the markets in the city being within walking distance of each other, snowfall is always a possibility at the Christmas fair’s so wrapping up warm is essential. The Christmas Fair situated on the Vörösmarty Square in the very centre of Budapest, is the oldest in the city. Craftsmen begin selling their goods there on the 9th of November but the Winter Festival doesn’t begin until the 23rd of November and finishes on the 1st of January, so it is worth waiting until then to go. A giant advent calendar accompanied by choral singing set the scene as the smell of roasted goose and paprika sausage bombard the senses. Hungarian delicacies like honey cookies and chimney cake are a must-have when visiting the wooden stalls that contour the market. Ranked in CNN’s top ten Christmas Markets, the Czech Republic’s Capital city of Prague might just be what the European holiday traveller is looking for. The location of many a wanderlust snap on Instagram, The Old Town Square in Prague is the picturesque host of a winter wonderland market. Open from the 1st December to 6th of January, the idyllic setting and sensory overload make this festive event simply magical. Wooden toys and puppets, a handcrafting tradition that is still strong in the Czech Republic, make excellent presents to bring home to children. The hypnotic aromas of wood smoke, BBQ blood sausage and mulled wine titillate the taste buds while wandering through the Czech festivities. Folk dancing and music are performed regularly while workshops and demonstrations of crafting are available to little ones. A real-life nativity scene with a donkey, sheep and a llama, is located by the brightly lit Christmas tree, bringing the biblical story to life. There are over 20 Christmas markets for visitors to choose from in the Austrian capital of Vienna, the first one starting as far back as 1298, making it one of the first homes of the humble events. The Viennese Dream Christmas Market held in front of the city hall will no doubt be the unforgettable highlight of a winter visit to the country’s capital. Opening on the 17th November and running every day, including Christmas day, until December 26th, the market is sure to cast an enchantment over any visitors. The delightful fragrances of the punch and chestnut stalls are scattered amongst the stalls of artisan meats and charming gifts. The gentle lull of international carol choirs can be heard as market-goers scan through the artistry on display. Situated on the ground floor, inside the City Hall, there is an area dedicated solely to children where they can learn how to make Christmas cookies and candles. The medieval Belgian town of Bruges serves as a superb location for one of Europe’s favourite Christmas holiday destinations. From the 23rd of November until the 1st of January, the old town transforms itself into a merry utopia, charming its way into the hearts of all those lucky enough to visit. The Bruges Christmas Market Village takes centre stage of the holiday season in the city, located directly in front of the historic towns Belfry of Bruges. An ice rink with a captivating white-blue lit tree at its heart commands the focal point to the square among the surrounding booths selling trinkets and the infamous Belgian chocolate. The narrow 12th Century streets leading off the main square, beautifully adorned with all manner of fairy light, bobbles and wreathes, give the illusion of stepping into a Christmas movie and filling visitors with an overwhelming sense of Christmas cheer. It’s hard to choose where would be the best place to go for to get that astounding excitement that a child gets on the lead up to the holiday season. Taking a weekend away to explore and become 5 years old again in the magical enchantment that is Christmas can reignite the seasonal cheer and there is no better place to go than a continental yuletide market.